Two armies stand nervously on the virge of valley. They stare uncertainly at their commanders and do not want to run down the hill. They just play with swords in their hand and hope, that somebody changes his mind. But that’s a naive idea. The decision has been given and now only the two generals are waiting for the right moment to give instructions for the attack. Order will eventually be given by authors Trevor Benjamin and David Thompson, who are signed under War Chest board game. It joined Alderac Entertainment Group’s (AEG) wide stables and got to market in 2018. Esdevium Games is the European distribution. Players get a really heavy box, whose lid swings like a real chest. 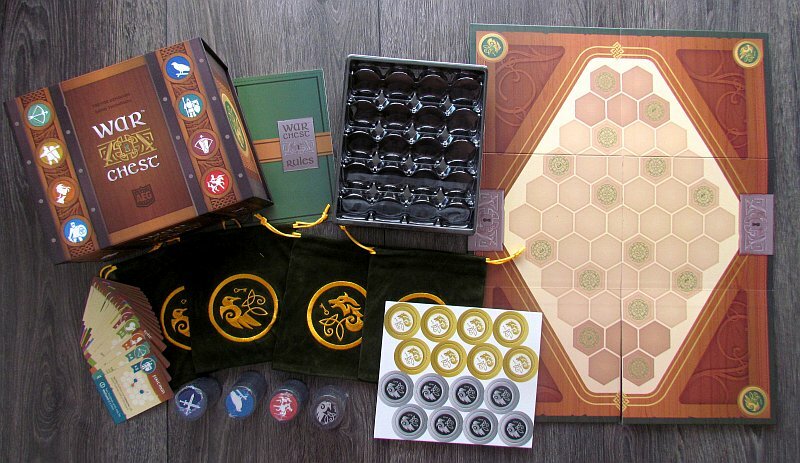 Inside, they find a cardboard sheet with eight control tokens in two player colors – silver and gold. They have to be pushed out and put immediately in front of players. 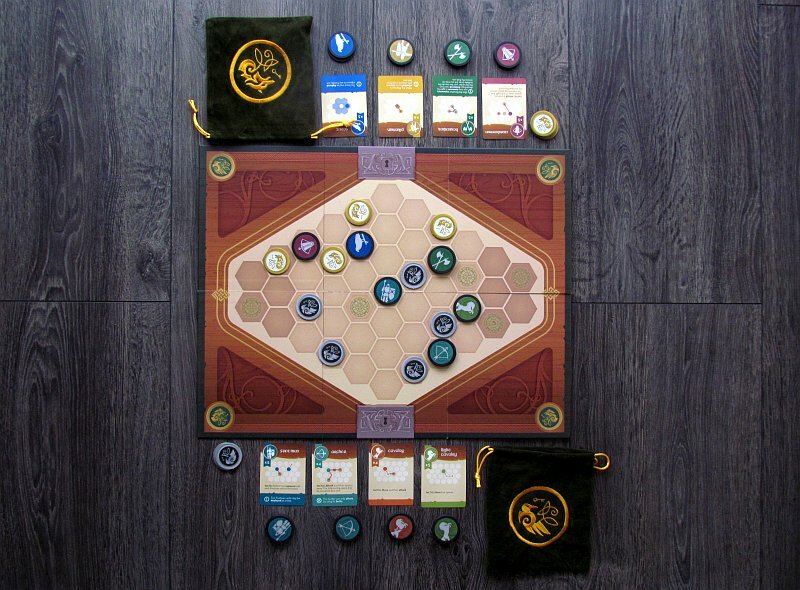 Two of them, at the same time, are placed on a map, that covers the whole table between the opponents and mark places that start under their control. Other spaces available for control are marked by silhouettes, they are neutral at the moment and are waiting for their owner. But more importantly, there are cloth bags and their contents – one royal token is thrown in there, and then another tokens according to random startup. 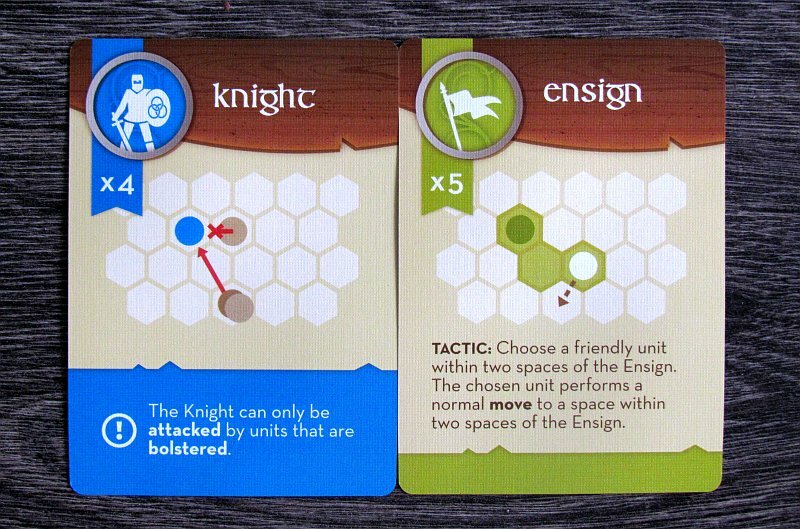 First, player gets random four out of eight shuffled unit cards, that they put in front of each other. And each of them comes with several unit tokens. Two of each type is taken and thrown into a bag, completing their starting offer to draw from to nine tokens. The remainder of warriors tokens create a stock directly in front of the player, where they will wait for recruitment during the game. At the start of the round, both players pull out the bag three tokens and hide them in the palm of the hand, so the opponent can not see them. If his stock inside the bag runs out, he picks up already used discarded tokens, puts them back in and continues drawing back until he has three again. 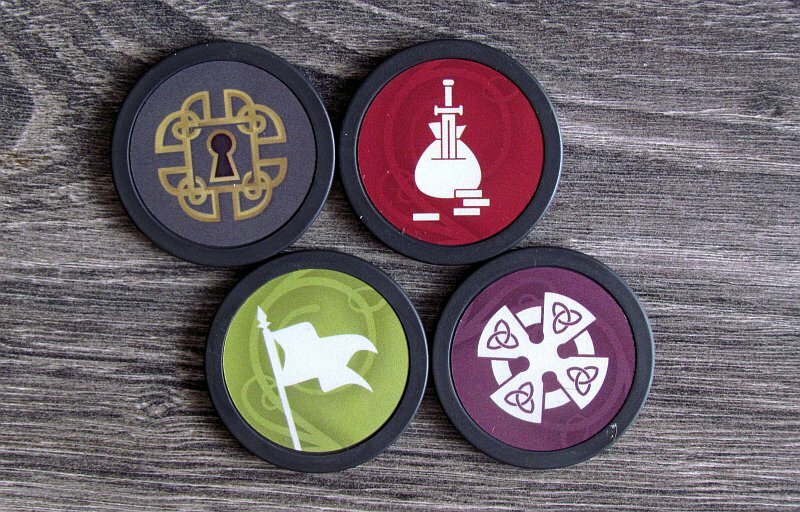 Then there are times, when players can use these three tokens. After one activity, both opponents alternate until their palms are empty. Tokens can be used with a very wide range of actions, depending on how they play them. Round fighter can simply be placed on a battle map, but only in free position under the player’s control. However, he may have only one specimen of each unit type present on the board. However, although unit can not be called a second time, player can use this token to reinforce one platoon already on the map. These tokens can be of different type, and the new one is simply placed on top of the previous one. But the token does not have to go on board with an action. Player may have completely different plans with it, and this time he can simply drop it on his discard pile with a picture up. He gets the chance to choose one of four options: use tactical ability of the dropped unit from the card, move the fighter on the map to the adjacent box, take control of the position, where his soldier stands or attack the unit standing beside him. It always has to be a unit of the same type as the one discarded. If the attacked unit has not been reinforced, it is discarded and its token is thrown away from the game (so it does not return to the player). If it was not the last chip of the unit (it has been strengthened in the past), the attack only weakens it, but warrior remains on the map and its owner can continue to issue orders in the next move. Tactics of discarded units are often very advantageous and powerful. Therefore, it is important to use them. But while the top-down play of image casts the player directly into the middle of the action, in some cases, they may want to hide their token, sneak a little and discard it with a picture pointing down. This can effectively confuse the opponent, but first of all, the last three actions will be made available: becoming a starting player (take over initiative from an opponent) or recruiting a new token from his inventory next to the board and adding it to the bag to the existing ones. In this way, players adjust the ratios of the units, they have at their disposal and also get compensations for already defeated soldiers. Players are trying to move their units smart enough to get four locations on the map under their control. Anyone, who can master it with his tactical maneuvers and get his last marker placed immediately wins. War Chest is a really interesting combination of bag-building (building up the cloth bag content you are drawing from) and fighting for position on the map. This connection is surprisingly interesting and tactical, which is probably because of a wide selection of actions. A player can use each token in one of eight ways or simply pass and do nothing (but still discard a token). However, the war game is here as well, althoug only on second place, because tokens are the main heroes. And handling with them is really nice. Players will enjoy every moment, they can play with them in palm of their hand, far from the point of view of their opponents. It’s actually a Tash-Kalar style battle, but you do not create any shapes or elements. Instead, players must fight directly between themselves. Striking the opponent’s stones is absolutely vital, because he will not simply allow you to occupy the majority of the key places on the map. But the players really feel like war veterans. They can plan and use the tactical capabilities of their units to gain advantage over the opponent. Throughout the course is the impact of the abilities of the participants themselves obvious and the coincidence has little effect here. Each of the tokens offers so many variations, that it is always possible to think of something suitable. But it also slows the turn down. The game is primarily intended for a pair of opponents, who will be facing each other. Because everything is thoughtful and exciting, it probably should require some time. But an intense experience usually lasts only slightly over half an hour. 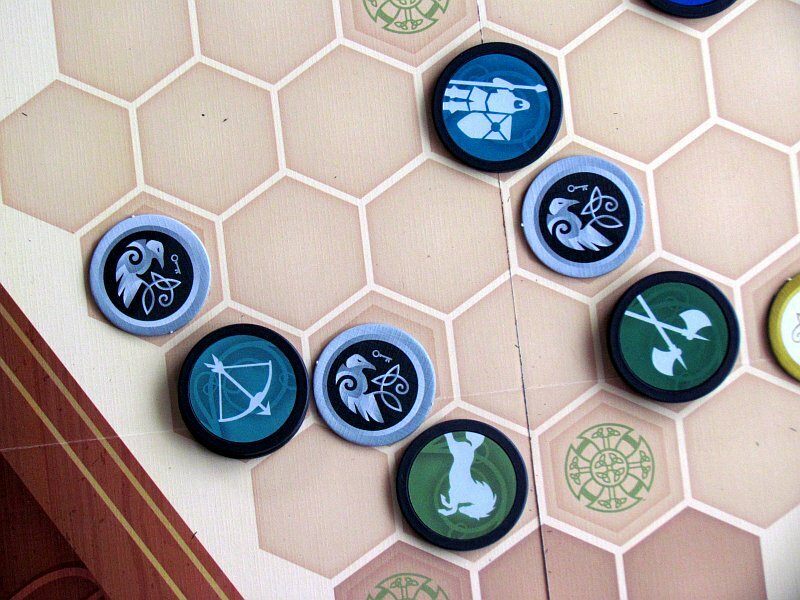 Players simply discard tokens, that will not return to the game, and sooner or later, one of them has to retreat from some of the control points on the map. Processing of the game is absolutely accurate. The main element is, of course, tokens, that look luxurious. Feeling of something bigger is added to box by cloth bags and the box itself. There is even a binder for the chips. This game really shows its price and you always look forward to seeing it. The only minor detail is, that when players overlay a symbol indicating the position they are fighting for, it can not be easily discerned from the surrounding boxes at first glance. 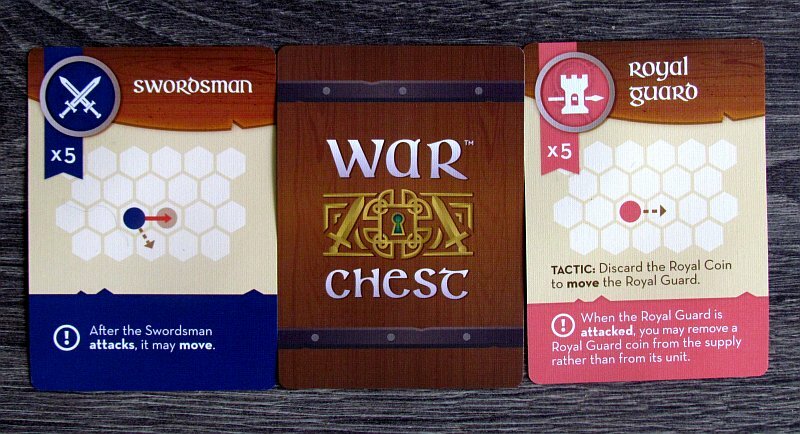 War Chest is a great and fun game for two opponents. It allows a team variant, but the direct duel is best. 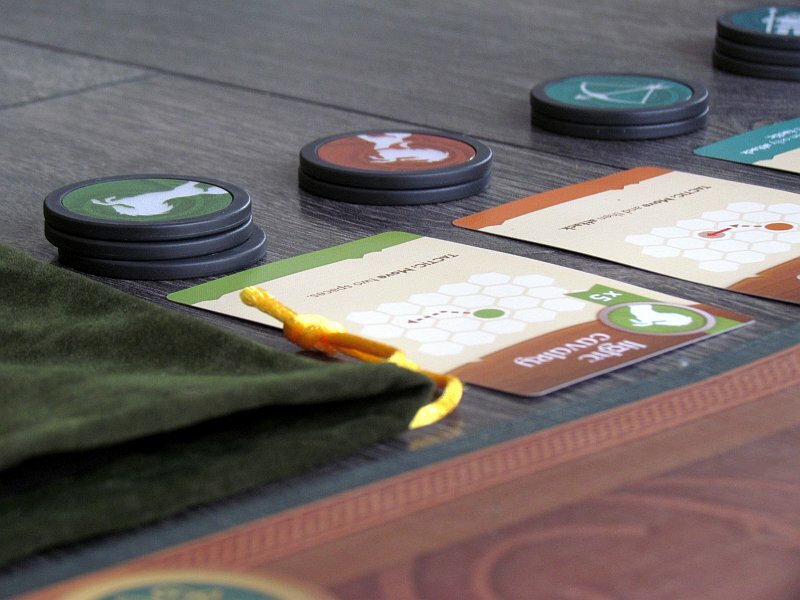 Movement, attack, and maneuvering with tokens, but it all depends on the player’s ability to combine his troops into bag well and make full use of his options. Tactics is the first in War Chest, just as it should be.